Golfers have access to tee times at Rocky Crest and use of the driving range or choose the “Cottage Special” to play UNLIMITED rounds on Clublink's Rocky Crest, Lake Joseph and Grandview Golf Clubs for only $440/week, cart included! The fully appointed villa offers 4 bedrooms and 4 bathrooms and at 2671 square feet is the largest cottage at LAKESIDE. In addition to the master king bedroom with ensuite and walk-in closet, one bedroom has a queen bed with ensuite, another bedroom has a queen bed, and the 4th bedroom has 2 twin beds, plus a crib. The main floor living room features a 2-story cathedral ceiling, fireplace, satellite TV and comfortable seating with a sofa that also converts to a bed. The attached Muskoka room provides dining seating for 8 or a great place to host card or board games. A two-sided fireplace leads to the outdoor patio, complete with Muskoka chairs and a high-end Weber BBQ. The fully equipped gourmet kitchen with granite countertops offers island seating and stainless steel appliances. The dining room has seating for 10 and a walkout to the outdoor patio. The villa is professionally decorated, offering the conveniences of home, including 2 flat screen TVs with DVD players, WiFi, Internet and weekly maid service. Though equipped with laundry facilities, all linens and bath towels are provided. Amenities of the resort include 3 restaurants, 2 pools, 2 large docks on Lake Joseph, sandy beach for kids’ play, hot tub, canoes, paddleboats, paddleboards and kayaks, water trampolines and slides, fishing, golf putting range, tennis courts, basketball, pool and ping pong tables and hiking trails. The fully equipped workout facilities also offer a whirlpool and sauna for post workout relaxing. In the summer, a kids camp runs full-day programs to accommodate golf games or relaxing by the lake. Family from Toronto with a cottage nearby. Backdrop of Muskoka with all of the amenities. Accessibility to world class golf course. 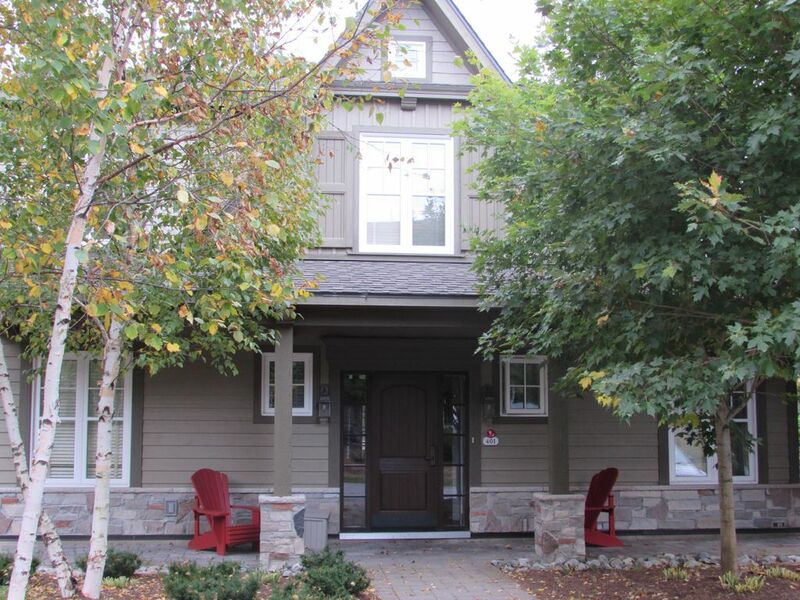 Walking distance to lake Joseph and serene Lake Armishaw. large screen TV/ seating/pool table/lounge/work out room and hot tub in accessible Private members lounge. outdoor salt water pool by Lake Armishaw & outdoor pool near Lake Joseph. Towels available onsite. The property met our family’s needs very well. The waterfront staff were wonderful. The cottage was beautiful and very clean. The location was great and Howard was very helpful throughout the weekend. Thank you for hosting us! Would recommend for anyone and would go back anytime. Six of us experienced the wonderful Canadian winter (-20+ Celsius temperatures) over our stay. The property was spacious well appointed and close to all activities we wanted to experience. The pond at the back was a great treat. The property was as nice as it appeared on this website. There were 7 adults and two children staying and the house was more than big enough for our needs. The location in Muskoka is beautiful and the amenities are all within walking distance. I would have no hesitation in recommending this rental to anyone. Just spent a wonderful 5 days with my girlfriends at this property. The house was beautiful and very comfortable - this is definitely a place we will return to. Great for couples as well. We are ClubLink members and Rocky Crest is just around the corner. I stayed at this property for 2 nights around New Year's Eve and it was an absolutely flawless experience. The cottage is exactly as it appears in the photographs, if not even better! It is fully equipped with lines and complete kitchen, and even has an espresso machine. The staff at the Rocky Crest resort are extremely helpful and the club house where the hot tub and pool table are found is easily accessible. We were the only ones using the hot tub at the time when we went. Skiing is very close by (45 mins away) and Perry Sound is only 20 mins away from the property. Overall, a beautiful cottage and excellent service. I would definitely stay here again! Located just two hours north of Toronto, this 4-bedroom, fully equipped villa offers all the amenities of home, and then some. The standalone villa is part of Clublink's Lakeside at Rocky Crest Resort, located on prestigious Lake Joseph, and home to the nationally ranked 18-hole Rocky Crest Golf Course. Golfers have access to tee times at Rocky Crest and use of the driving range. The fully appointed villa offers 4 bedrooms and 4 bathrooms and at 2671 square feet is the largest cottage at LAKESIDE. In addition to the master king bedroom with ensuite and walk in closet, one bedroom has a queen bed with ensuite, another bedroom has a queen bed, and the 4th bedroom has 2 twin beds, plus a crib. The main floor living room features a 2-story cathedral ceiling, fireplace, satellite TV and comfortable seating with a sofa that also converts to a bed. The attached Muskoka room provides dining seating for 8 or a great place to host card or board games. A two-sided fireplace leads to the outdoor patio, complete with Muskoka chairs and a high-end Weber BBQ. The fully equipped gourmet kitchen with granite countertops offers island seating and stainless steel appliances. The dining room has seating for 10 and a walkout to the outdoor patio.